This item will be useful when used with a walking frame in many locations – around the home, or even out shopping. 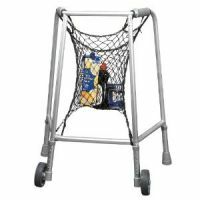 With a zimmer frame net bag, it’s easy to carry shopping or other bits and pieces while keeping your hands on the frame itself. 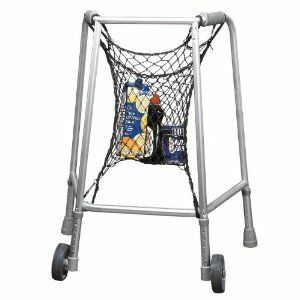 It’s a knotted nylon net bag for walking frames, and can be easily clipped onto any frame to allow a wide range of objects, such as newspapers or shopping to be carried. Great! Easy to order.Great delivery timing. Excellent product. My mum is using this on her walker. The bag fits nicely, even around the seat/box. Great value for money. Thank you!